Senior Indian and Russian officials have discussed ways to develop trade ties and remove barriers in investment, science and technology as well as other issues of mutual interests. 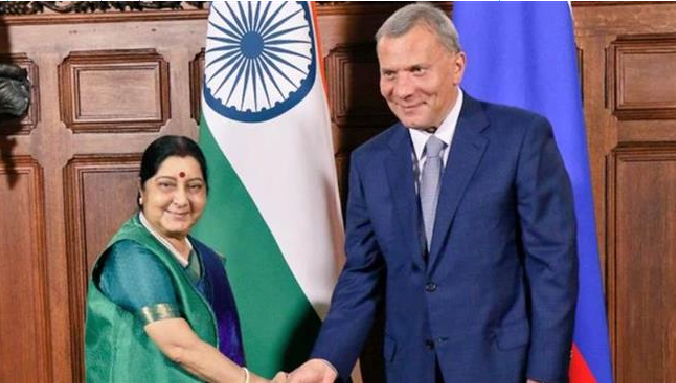 India’s External Affairs Minister Sushma Swaraj and Russian Deputy Prime Minister Yuri Borisov held talks over bilateral matters during the 23rd Inter Governmental Commission (IGC) in Moscow on Friday. The commission has met in the run up to the 19th India-Russia Annual Summit which is expected to be held in India early next month. Russian President Vladimir Putin is to visit India for the summit and meet with Prime Minister Narendra Modi. “The Deputy Prime Minister and I have conducted a comprehensive review of our relations. I am satisfied with the outcomes of our meeting,” Swaraj said. “I am confident that our deliberations today will further strengthen our cooperation with Russia in all fields in existing and new areas of cooperation,” the minister added. During the meeting, the two sides discussed ways to enhance bilateral trade which in 2017 reached $10.17 billion. Swaraj went on to say that the two sides had identified new areas of cooperation in agriculture, infrastructure, transport, space and Science and Technology, and discussed the possibilities of working together on projects in third countries as a new dimension of strategic partnership.